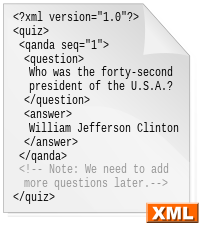 ^ "XML stands for Extensible Markup Language. The X is for the first syllable of Extensible. eXtensible is a spelling error." ^ Fitzgerald, Michael (2004). Learning XSLT. Sebastopol, CA: O'Reilly Media. pp. p.243. ISBN 978-0-596-00327-2. ^ “Publishers, multimedia, and interactivity”. Interactive multimedia. Cobb Group. (1988). ISBN 978-1-55615-124-8. ^ Harold, Elliotte Rusty (2004). Effective XML. Addison-Wesley. pp. 10-19. ISBN 978-0321150400. http://www.cafeconleche.org/books/effectivexml/.